^ "30 millionth VW Golf rolls off assembly line in Wolfsburg". Green Car Congress. 14 June 2013. Retrieved 2013-06-14. ^ Georg Kacher, ed. (February 4, 2014). "VW Golf R 2014 review". carmagazine.co.uk. Retrieved June 29, 2018. ^ a b c Pontes, Jose (2015-01-31). "Europe December 2014". EVSales.com. Retrieved 2016-02-07. European VW e-Golf sales totaled 3,328 units in 2014. ^ a b Cobb, Jeff (2016-01-06). "December 2015 Dashboard". HybridCars.com and Baum & Associates. Retrieved 2016-02-07. VW e-Golf sales in the United States totaled 357 units in 2014 and 4,232 in 2015. ^ Norwegian Road Federation (OFV) (January 2016). "Bilsalget i desember" [Car sales in December] (in Norwegian). OFV. Retrieved 2016-02-07. A total of 16,388 new VW Golf cars were registered in Norway in 2015. On the heading "Registreringsstatistikken t.o.m. desember 2015" click "2015, des, Personbiler, Merkefordelt"
^ Pontes, Jose (2016-01-30). "Europe December 2015". EVSales.com. Retrieved 2016-02-07. European VW e-Golf sales totaled 11,214 units in 2015. ^ Kane, Mark (2016-02-06). "Volkswagen Golf GTE Is The Most Popular Plug-In Hybrid In France". InsideEVs.com. Retrieved 2016-02-07. A total of 5,583 plug-in hybrids were sold in France in 2015, including 543 BMW i3 REx models. ^ a b Gibbs, Nick (2016-03-15). "Hybrid sales expected to triple in Europe as tougher CO2 rules loom". Automotive News Europe. Retrieved 2016-02-22. 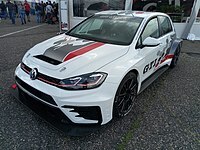 VW Golf GTE sales totaled 1,097 units in 2014 and 17,300 as reported by JATO Dynamics.